Alfa Romeo’s Quadrifoglio will hit the market as the Giulia’s first available trim, but following close behind is the base Giulia that has debuted at this year’s Geneva Auto Show, with two other trim options. 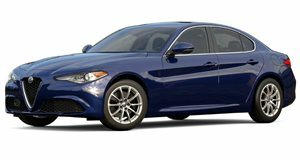 The Giulia will have either the base or the mid-level trim, called the Giulia Super. Options for the sedan’s trims spread across the board, with one gasoline engine and two diesels, mated to either a six-speed manual or eight-speed automatic. There will even be an option for either RWD or AWD. The gasoline engine will be a 2.0-liter turbocharged four-cylinder engine producing either 197 horsepower or 276, the more powerful version set to hit US shores. The diesels are divided by horsepower ratings. It will be a 2.2-liter turbocharged four-cylinder with either 148 or 177 horsepower. Unfortunately, the US won’t get a whiff of those diesels. It’s expected the interior will be fitted with different screen options for the Connect 3D Nav Infotainment System, as well as all controls wrapped around the driver’s field of view.